Posted by Elana Anderson in Customer Experience, Integrated Marketing, Marketing, Marketing Technology, Online Marketing. I recently treated myself to a new laptop. 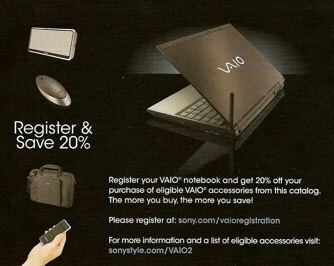 A Sony Vaio – it’s chic, sleek, and tiny. After I got rid of all of the marketing crud – you know, the start up gobbledygook and free trial software, I fell in love with it. I love it so much that I also fell for the “Register and save 20% on accessories” offer that came in the slick little catalog insert in the box. No, I don’t want a credit card! I want my 20% discount! Refusing to relent, I called the 800 number again. This time I explained my situation and the service representative agreed to take my order and give me the discount. Mission accomplished – FINALLY! What should have been a simple seamless process took two weeks. What does the Sony brand engender for you? If you are like most then great design, high quality, stalwart brand probably top the list. But my experience gives me a view into the inside: big organization, internal silos, and politics. The campaign I described here doesn’t have that many components — it shouldn’t be THAT hard to get right. But, this kind of campaign does touch different parts of the marketing department (people who probably don’t know each other and sit in different offices) and the broader business. My advice? If you can’t get a simple integrated program like this right then don’t do it at all. Why? It damages your brand when you mess it up. If you are running campaigns with multiple components that cross organizational silos then you need to organize the stakeholders and nail the process down. Understand the steps, define the handoff points, map the time between them. In the end, it’s all about the process. Ideally, a campaign like this is automated. But, sufficient testing is required up front to make sure it works. And, don’t forget to put some process checkpoints in place so that if something breaks along the way you get an alarm bell. You can have great creative (Sony does) but if the process is disjointed you lose business and look foolish.